BUILDING a home fit to accommodate the Royal Navy’s two most colossal warships ever made takes a special kind of team. More than £100m needed to be pumped into revamping Portsmouth Naval Base – one of the biggest transformations undertaken at the site in a century. Contractors, local firms and a work force of hundreds all had to unite with the navy and Ministry of Defence to complete the ambitious programme of upgrades. BAE Systems, which maintains the Royal Navy’s fleet of warships based in Portsmouth, took the helm of the project. ‘This is probably the most significant piece of work that has been done on this base probably in the last 100 years,’ said Chris Courtaux, BAE System’s head of base engineering and energy services. A 30-year veteran with the defence firm, Chris admitted the upgrade in Portsmouth was the most complex challenge he had been involved with. And it is easy to see why. His job is to ensure all the systems and equipment used on the base are safe to operate – a task that requires a keen eye for detail. ‘I’m responsible for buildings, waterfront assets, wood shops, cranes – anything you can think that’s risky on this site, or that you can’t think of, I’m responsible for ensuring are safe to use,’ he said. He added: ‘The work that has been done here and across the site has been with all sorts of industries and companies. ‘The management and the safety of the site is very much a collaborative piece of work. ‘We have to get that right because we have to make sure what we do works on this base and it’s done in a very safe manner. ‘It’s absolutely crucial. That whole responsibility with us and the supply chain and the customer is critical to delivery. One of the key parts of the base’s overhaul involved restructuring the entire northern quarter of the site and making space for the two 65,000-tonne mega warships. A huge section of 70,000 square metres needed to be rearranged. It was a role that Chris said was like ‘a jigsaw puzzle’, that required a close co-operation with the naval base commander and the HQ’s head of the infrastructure for the Queen Elizabeth class, Captain Iain Greenlees. The project saw major enhancements to the jetty, parts of which dated back more than 90 years. The berths needed to be strengthened, to be able to cope with the vast weight of the carriers when they are alongside. About 276 metres of jetty have been reinforced with more than 3,300 tonnes of new steel work. While new navigation lights have been installed in the harbour and Solent, with huge new fenders and specially-designed gangways delivered to accommodate the giant ships. Hard standing facilities of the jetty have been upgraded. These include a dedicated engineering support area, responsible for ensuring the naval base is ready to support HMS Queen Elizabeth and Prince of Wales, in the centre’s Illustrious Complex. The complex will also act as an amenities centre for the BAE Systems and sub-contractor engineering workforce to provide domestic, catering and recreational facilities. In the centre’s Ark Royal building, there is a holding area for up to 200 personnel awaiting transfer to the ship at anchor, conference and visitors centres as well as facilities to cater for VIP visitors for exhibitions and visits. Last week work to install a specialist combined heat and power plant at the base began. It will recycle energy, reduce the base’s carbon footprint and save the Ministry of Defence up to £4m a year in energy costs. The £12m plant, which will be completed next year, will help meet the increased energy demands when the carriers arrive. Based inside the former boiler house, the new system produces electricity and heat from a single fuel source and is able to retain excess heat which would have otherwise been wasted. One of the others involved in getting the base shipshape is Simon Hughes, estates programme manager at BAE Systems. His role involved him co-ordinating the delivery of the northern quarter of the naval base. Simon said: ‘It’s been a really big project. It’s been exciting and challenging at the same time. ‘I can’t believe how quickly the time has gone from where I look back six months ago, where the jetty was just being finished, to where we are now. ‘When you look at how much work the teams have delivered in that time. One, that’s gone extremely quickly but two, a lot has been done. 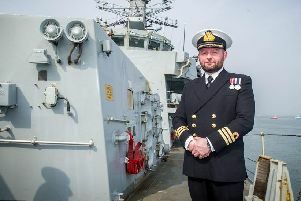 Previously he worked at the shipbuilding wing of the naval base before it was axed and moved up north in 2013. He was part of the team that helped construct Queen Elizabeth and was up in Rosyth to see her being pieced together. ‘I found it jaw-dropping when they had actually consolidated those blocks, making it structurally complete, and then you had a true grasp of the sheer size of the vessel and how impressive it looked,’ he added. But once the ship does arrive in Portsmouth, the team at BAE Systems faces a new task altogether – overseeing the ship and the needs of her crew. John Newell is the man in charge of this new chapter. As the head of the Queen Elizabeth-class support team, he will be responsible for co-ordinating all the services assisting the vessels whenever they arrive at the naval HQ. ‘Its a great role,’ he said. ‘I have got a smile on my face because it’s all about to happen. The two new aircraft carriers are the largest vessels to ever use the naval base. But this is not a challenge that is daunting for John. The retired Commodore, with 38 years of experience in the Royal Navy, knows exactly how to deal with HMS Queen Elizabeth and HMS Prince of Wales. ‘What is different about HMS Queen Elizabeth compared with any other ship – it’s just really its scale,’ he said. ‘As an example, if you want to do some work on the flight deck and put a tent up on the flight deck, it’s just big. ‘But how do you do it quickly, big enough, and take it down? Planning for the arrival required John and his team to look at how they would deal with a range of issues, from the regular maintenance periods of the warship to equipment support. It meant liaising with the Aircraft Carrier Alliance, which is currently in charge of Queen Elizabeth, to make the aircraft carrier’s transition to Portsmouth as smooth as possible. This includes creating 3D walkthroughs of the ship to setting up an efficient way of working on the ship. He and his team have also been in charge of everything, right the way down to how the new offices are laid out – and even the decor of each building. To tackle the workload of coping with HMS Queen Elizabeth, John’s team is split into three groups: platform managers, maintenance managers and the warship technical authority. He now can’t wait to see the leviathan sail into the city. ‘I have been wanting to be involved in this project for years,’ he said. ‘I had been involved a little bit with it when I was in the navy. ‘But when I was offered the chance to come to BAE and be head of QEC support it was an offer I found difficult to refuse. Chris is proud to have been part of the project and paid tribute to all those who have worked alongside him. Portsmouth South MP Stephen Morgan last week formally opened the Illustrious complex. He too was blown away by the work to overhaul the base.